In his GEO 391 - Statistical Analysis for GIS course, Jack Floyd asked how preventative of a tool is hate crime legislation? In 2009, President Barack Obama signed the Matthew Shepard and James Byrd, Jr. Hate Crime Prevention Act into law. This law expanded on the 1969 United States federal hate-crime law (which included race, color, religion and national origin) to include attacks and crimes based on perceived gender, sexual orientation, gender identity and disability federally punishable. Annual reports from before (2008) and after (2013) the act was signed into law were extracted from the Federal Bureau of Investigation’s website and include total hate crimes (however they were defined that year) against persons, property and society by state. 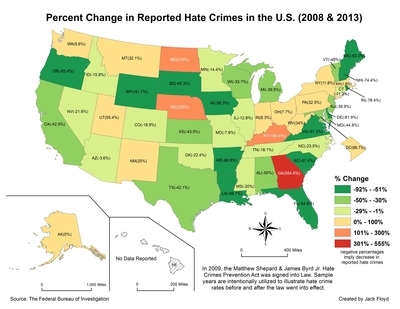 Percentages represent the relative increase or decrease in reported hate crimes, comparing data from 2008 and 2013. In the U.S., 32 states (including Washington D.C.) have seen a decrease in the number of reported hate crimes in 2013. Georgia, Kentucky, Nebraska, North Dakota, Utah, and Washington D.C. have all experienced over a 50% rise in reported hate crimes in 2013 compared to 2008. Floyd concluded that considering the histories of marginalized communities it is it is important to investigate trends in hate fueled crimes for more informative and effective policy approaches, especially in geographies where basic safety is of high concern.